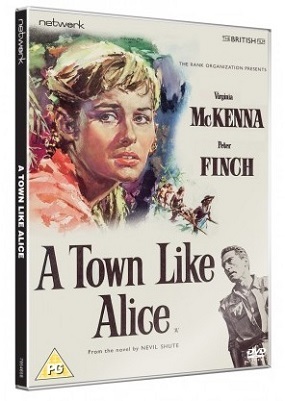 It’s probably 40 years since I last saw A Town Like Alice, the classic British drama based on Nevil Shute’s novel. I pass a house with a blue plaque remarking that Shute lived there every other day, so I’m curious to give the film another look. Especially as it’s just been released in a brand new transfer on Blu-ray and DVD. It’s the latest offering from The British Film cCollection, a 450-plus catalogue of titles released between 2013 and 2018. I’m thrilled that beloved titles like this are being preserved and restored, and not just the blockbusters we all grew up on, as important as they are. Five minutes in and it feels like I’m watching an episode of The Twilight Zone, another classic black and white production from the same era which was given the hi-def treatment a few years ago. There’s something magical about those sulphurous black and white images in high definition that give old films and TV shows a hyper-real look. (Trivia fans may note the photography is by Geoffrey Unsworth, later to work on a string of classics, including 2001: A Space Odyssey, A Bridge Too Far, and the first two Superman films). Virginia McKenna is mesmerising as Jean Paget, the well-spoken English woman taken prisoner by the Japanese during the Second World War. She and several other women and children are forced to trek through Malaya during the occupation. For the most part it’s heavy going as the women of all ages and assorted kids endure terrible hardships. (Making the movie must have been tricky at best, especially as working with babies and kids can be a nightmare for any director). It’s Jean’s romance with Australian Joe Harman that forms the backbone of the film. Although I find it hard to make the connection between the fresh-faced Peter Finch of this movie and the man who gave his unforgettable turn in Network, the movie for which he was awarded a posthumous Oscar in the 1970s. (Finch had worked with ’Alice’ director Jack Lee on The Wooden Horse, another fine British war movie six years earlier). Jean’s fascination with Joe’s hometown of Alice Springs leaves her swooning like a schoolgirl on a first date. While his fate at the hands of the sadistic Captain Sugaya after stealing some chickens for the women and children only adds to the misery. There is some comic relief here and there, often shoehorned in, but it’s still a fascinating story from one of the darkest times of the 20th century. After the first half hour it’s hard not to be hooked as the characters work their magic. Perhaps most notable is the lack of soundtrack. So many movies these days tell the audience what to think and when, with few directors brave enough to let the cast and story do the work. Yes, there is some comedic Carry On-style music to lighten the mood in places, but it’s refreshingly score-free for the most part. McKenna and Finch both won Baftas for their work, and while it used to be a staple of rainy weekend afternoons back in the days of three TV channels, on this wet Sunday afternoon I’m wondering why it’s not been on for a while. It’s possibly the insensitive dialogue in places, something which couldn’t be successfully trimmed. When TV series Tenko started in 1981, I remember thinking it was a carbon copy of this story (probably as a TV version with Helen Morse and Bryan Brown had aired the same year). The fact there hasn’t been a version since is intriguing. It would be a perfect vehicle for Carey Mulligan, Hugh Jackman and Inception’s Ken Watanabe. Aside from the pristine feature, there’s a wealth of extras for fans, including archive interviews with McKenna and Finch, a documentary on the movie, a theatrical trailer and image gallery. This 1956 offering might not be a perfect film, but for one viewer living in the same town as its author, A Town Like Alice is a cinematic postcode well worth returning to.